“Empowering the School Heads: Realizing their full potential, a Tool to an Effective Educational Management and Leadership” was the theme that animated the 3-day enhancement seminar-workshop held in 3 batches for school heads who served 5 years and below. Relevant pressures and thrill were generated from the participants as they underwent the process of celebrating their individual giftedness in the AGTA (Administrators Got Talent) contest, shared their particular skills in their portrayal of resolving conflicts, and showcased their artistic ingenuity and literary abilities in their individual portfolios. 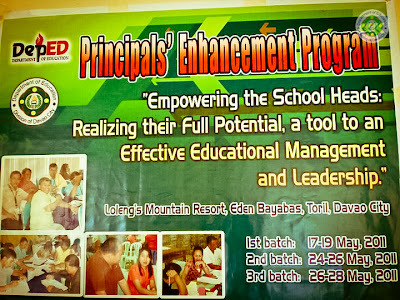 The Principals’ Enhancement Program had indeed challenged the school heads in the holistic point of view. Undoubtedly, Maria Antonia P. Diaz being the program proponent had successfully manifested the program’s importance and timely assistance to the school heads. The unconditional support and encouraging presence of Dr. Helen D. Paguican, Dr. Ma. Ines Asuncion, Eva M. Antipuesto, Erlinda Flores plus the dedication of the members of the TWG headed by Dr. Elsie E. Gagabe and Melanie P. Estacio made the program very significant and productive. This was further graced with the presence of Fr. Danny Montaña, Mr. Rene Lizada and Belle L. Torres as resource speakers. The PEP was held at Loleng’ Mountain Resort, Eden Bayabas, Toril, Davao City last May 17 – 28, 2011.